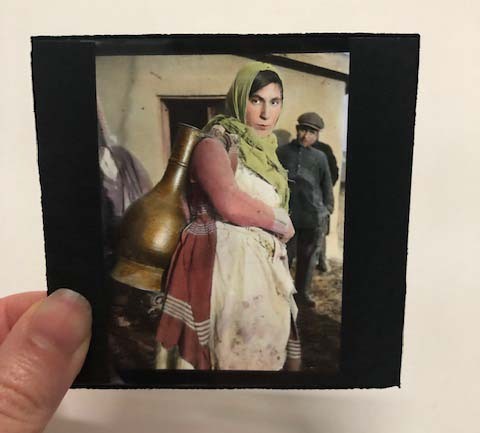 Recently, a metal case bearing the date 1928 was discovered in the JDC Archives, containing examples of a little known photographic artifact, the lantern slide. 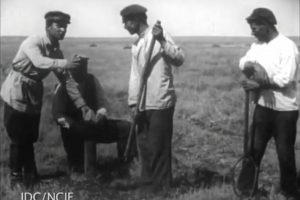 These transparencies show life in interwar Ukraine during the efforts of JDC’s Agro-Joint (the American Jewish Joint Agricultural Corporation). The lantern slides represent not only a medium that is unique, but highlight, in extraordinary detail, JDC’s involvement during a pivotal moment in Jewish life in Eastern Europe. Pre-dating photography, lantern slides originated in the 17th century as hand-painted glass slides held in an elaborate device illuminated by lantern or candle light, which allowed the pictures to be projected onto a wall. With the introduction of photography, lantern slides evolved into positive transparencies printed onto gelatin slides framed by opaque paper. This was viewed through a projector called a “magic lantern,” illuminated by kerosene lamps, arclight, and the highly combustible limelight. Magic lanterns were considered to be the precursor to cinema, as they were usually viewed in large theaters with narration and music. Lantern slides brought the world to life through pictures, stunning audiences with their color and images. Example of one of the hand-painted lantern slides in the JDC Archives collection. The slides in the JDC Archives are full of mystery. 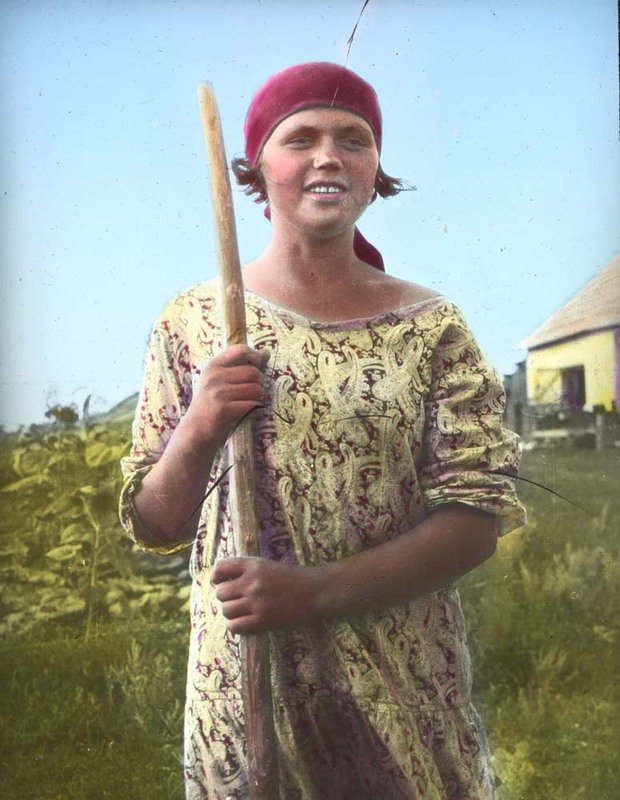 Discovered without any identifying information as to the photographer or model, they paint a striking picture of life in interwar Ukraine and Crimea. 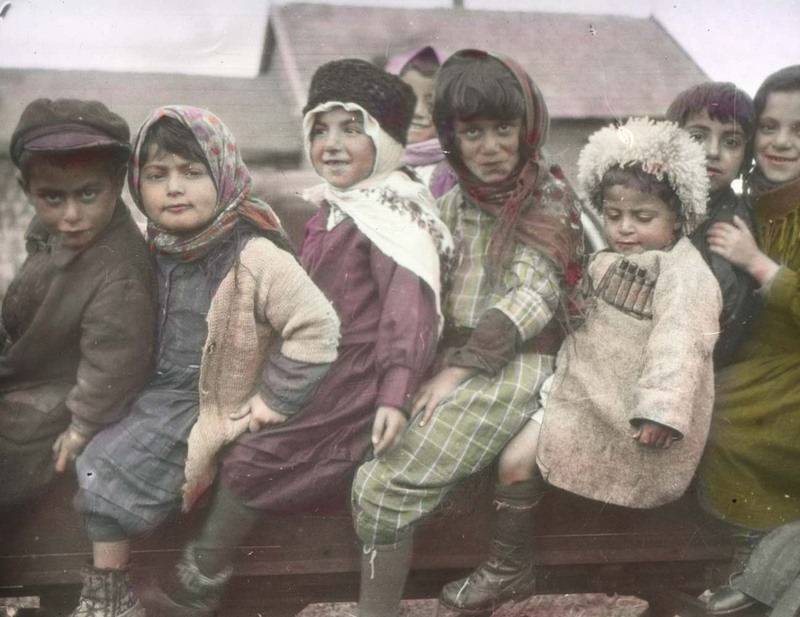 During the 1920’s, social and political chaos in the newly formed Soviet Union left many in the region struggling to reconcile with a new way of life. 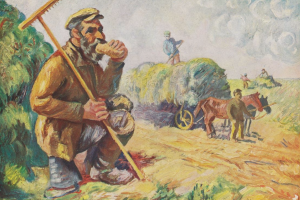 JDC brought aid to impoverished Jews in the region with the establishment of Agro-Joint, resettling some 70,000 “non-productive” Jews in agricultural colonies, where they were taught how to actively work the land and manage livestock in industrial schools. 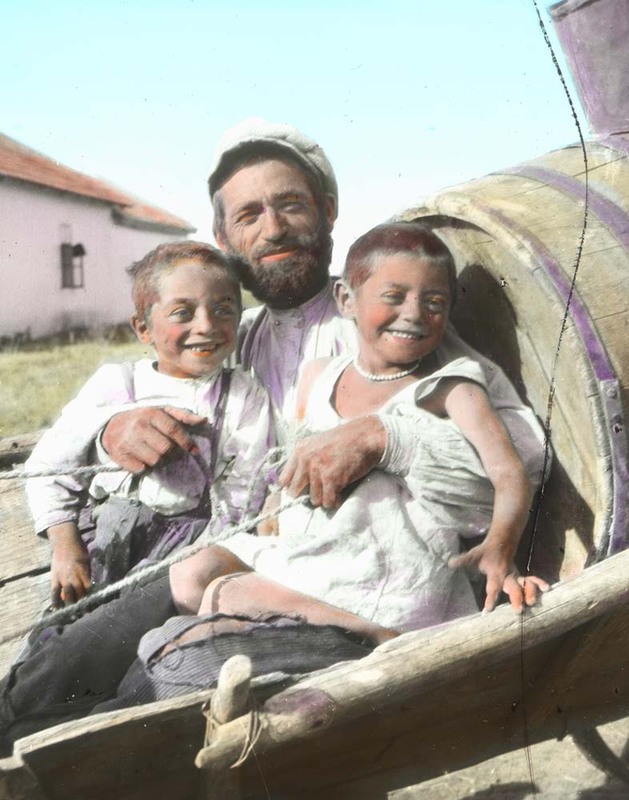 These particular lantern slides provide an unfiltered look at Agro-Joint life with candid portraits (which were hand-painted during processing). The colorized slides elevate the ethos of each composition as the images seem to become less static. One can literally feel the joy of children posing for a photo with their father, as well as the pride with which a woman embraces her new position and responsibility. 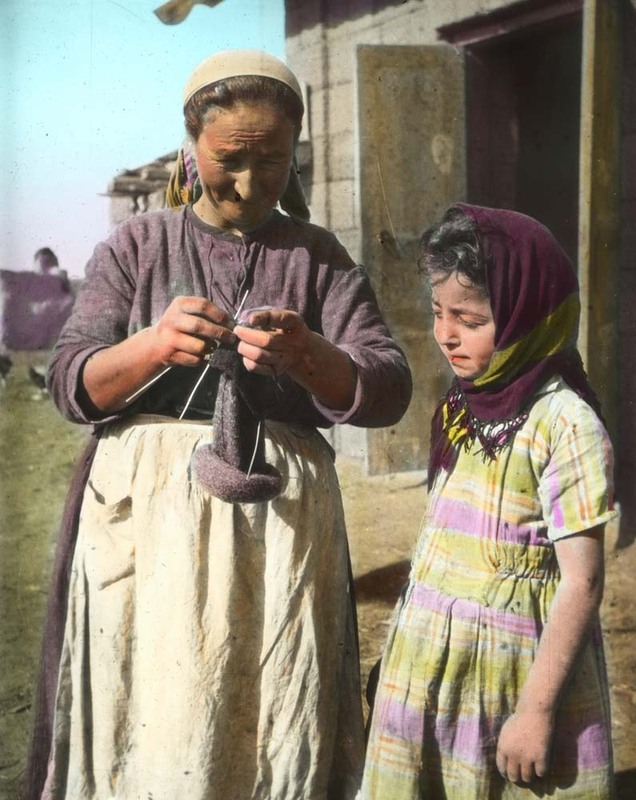 There were a variety of ages and skill sets present in these settlements, and even though individuals were learning a new trade and new way of life, old habits and traditions remained, as seen in a slide where an older woman shows a younger girl how to knit. The younger girl appears fascinated by the process, while pleasure is etched on the face of the older woman. These emotions would be lost in a monotone version of this slide. Most likely used as promotional material for the JDC, these lantern slides highlight the success of Agro-Joint and functioned as a way to educate the public on the realities of the other side of the world, in vivid color (in this case, painstakingly hand painted). A relic in the history of photography, these lantern slides also reveal the complexities that exist in the field of archiving. Most museums and archives value the lantern slide as a marginal part of the collection, often valued more for its content rather than its materiality. However, lantern slides are important artifacts in themselves. They were extremely difficult to produce, requiring photographers to transport large machinery which exposed themselves (and the prints) to risk from transit, weather, and people. 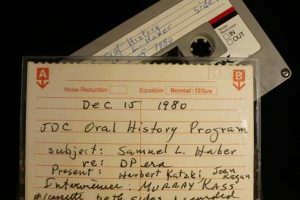 They have emerged as valuable artifacts in tracking the history of photography and are befittingly being preserved in the JDC Archives. This article was written by Charlotte India Eagle, who interned at the JDC Archives. She is pursuing an MS in Library & Information Sciences from Pratt Institute.